The Oscar-winning Skyfall singer, who celebrated her 26th birthday on May 5, sparked speculation about her upcoming album's title on the social networking website when she tweeted: "Bye bye 25... See you again later in the year." The cryptic post showed her making a thumbs up sign as she posed bare-faced in bed, with her hair tied in a ponytail. Fans considered it as a reference for the Rumour Has It star's third album, following in the same pattern as her previous two records, 19 and 21, which were titled after her ages when she made them. 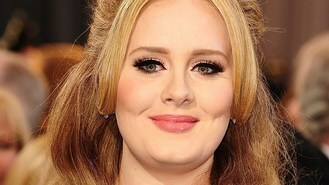 Adele, who celebrated her birthday with a low-key dinner in Chelsea with Alan Carr, rapper Example and his Australian wife Erin McNaught, is rumoured to have collaborated with Prince, Phil Collins, OneRepublic's Ryan Tedder and Diane Warren, as well as producers James Ford and Kid Harpoon, for her upcoming offering. Ryan teased: "I haven't heard everything she's done but I've heard everything we've done and I'm as proud of it, or prouder, as of anything we did on the first album. She is sounding even better than ever." Since releasing 21 in 2011, Adele - who underwent throat surgery in November 2011 - has become a wife to charity entrepreneur Simon Konecki and mother to their 18-month-old son Angelo. The 26-year-old, who received an MBE last December, told Vogue in 2012 about her musical hiatus: "I am f***ing off for four or five years. If I am constantly working, my relationships fail. "So at least now I can have enough time to write a happy record. And be in love and be happy. And then I don't know what I'll do. Get married. Have some kids. Plant a nice vegetable patch."